This exhibition will look back on two hundred years of history shared by the Museum and society, as well as focusing on Spain’s heritage policy, the developments that helped to build up the Museum’s collections, and the transformation of the Prado into a point of reference so that Spanish and foreign writers, intellectuals and artists could reflect on Spain’s past and the country’s collective identity. Organised around the art and documentary collections at the Prado (both visual and sound archives), which shall be exhibited alongside works by artists who have come into contact with the Museum over the last two centuries (such as Renoir, Manet, Chase, Picasso, Arikha, Rosales, Saura and Pollock, amongst others), the exhibition will present a total of 168 original works, 34 from different Spanish and foreign institutions, together with a significant variety of complementary materials such as documents, maps, pictures, photographs and audiovisual installations. Since the Museo Real opened its doors on 19th November 1819 with works from the Royal Collections, this institution has served as one of the leading depositaries for the history of Western art, a key point of reference for Spanish culture and an object of collective pride. Some two hundred years after it was founded, the Museo del Prado would like to reflect on all this and share its celebrations, especially with those who visit the exhibition that is due to take place over almost four months in Halls A and B, an exhibition designed to provide a rich insight into the Museum’s development and historical significance. Organised by Javier Portús, Chief Curator of Spanish Painting (up to 1700) at the Prado, in his own words the exhibition “proposes a chronological journey through the Museum’s evolution, which enables us to highlight the aspects that have made this a living institution, one that has been especially influenced by the country’s historical vicissitudes. The main aspects the exhibition will focus on when telling this story include the following: Spanish patrimonial awareness; the ways in which the dialogue between the Museum and its public and society at large has evolved; the ways in which the Museum itself has reflected some of the critical moments in Spain’s history over the last two centuries; the criteria that have guided the creation of its collections and exhibition policy; the development of the history of art as a humanistic discipline; the impact that the Museum and its collections have had on the art and artists of the nineteenth and twentieth centuries; and the symbolic contents that have gradually been associated with the Museum as an institution”. In this respect, the chronological journey will revolve around eight different periods, through which we can see how the institution has developed its own personality, at the same time as it has reflected the country’s historical development. Amongst the themes that will be addressed, based on their artistic importance, we might mention the Museum’s key role as a venue for reflection and inspiration for successive generations of Spanish and foreign artists, as represented with works by Renoir, Manet, Chase, Sargent, Arikha and Pollock, amongst the foreign artists, and Rosales, Saura and, in particular, Picasso, amongst the Spanish artists. By using all kinds of documents and representative works of art in each case, the exhibition also focuses on the following aspects: the institutional ups and downs experienced by the Prado; the ways in which its collections have grown and the variety of formulas that have been employed to this end; the criteria for organising and exhibiting the collections; the manner in which historical and artistic studies have been promoted; and the ways in which the Museum has fulfilled its didactic vocation and established its relationship with society. The exhibition will feature a total of 168 original works, of which 134 form part of the Museum’s own collections and 34 have been loaned by different Spanish institutions and foreign institutions in the United States, France, Hungary, the United Kingdom, Israel, Germany and Russia. 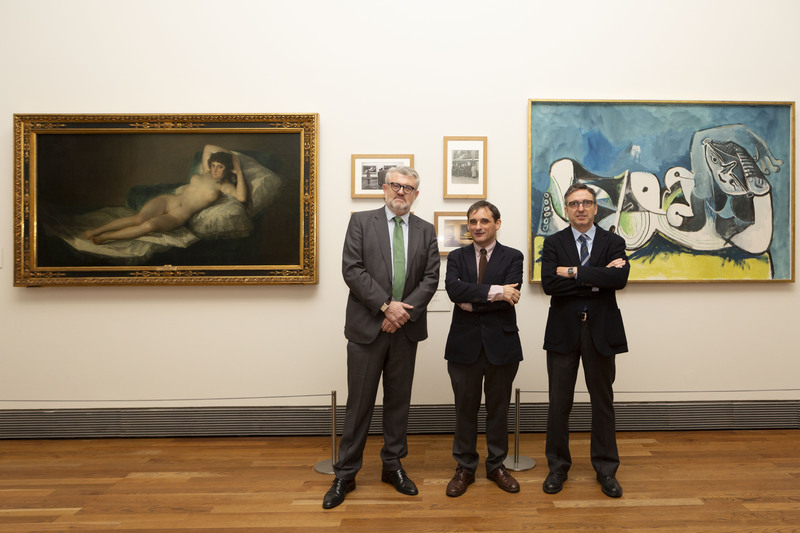 These works will help to create a context that enables us to understand the Museo del Prado in relation to general trends regarding European heritage policy, whilst also highlighting the terms of the dialogue that many contemporary artists have maintained with the institution.